Cifaldi, L., Locatelli, F. and Fruci, D. (2016). Killer Cell Ig-like Receptors (KIR)-Binding Assay for Tumor Cells. Bio-protocol 6(18): e1931. DOI: 10.21769/BioProtoc.1931. Natural killer (NK) cells play key roles in innate and adaptive immune responses against virus and tumor cells. Their function relies on the dynamic balance between activating and inhibiting signals through receptors that bind ligands expressed on target cells. The absence of inhibitory receptor engagement with their ligands and the presence of activating signals transmitted by activating receptors interacting with specific ligands, leads to NK cell activation (Lanier, 2005; Raulet et al., 2001). Thus, the balance of the ligands expressed for inhibitory and activating receptors determines whether NK cells will become activated to kill the target cells. This protocol allows to assign a precise ligand specificity to any given receptor on NK cells. Thus, if a tumor cell expresses the ligand, this protocol will allow to evaluate its interaction with the specific receptor. In particular, killer cell immunoglobulin (Ig)-like receptors (KIR) recognize their ligands (HLA class I molecules) through the direct contact with HLA class I heavy chain residues and amino acid residues of the bound peptide. This protocol will allow to test the effect of amino acid substitutions or other mutations on the binding of KIR to HLA class I. We used this protocol to depict the role of ERAP1, a key component of the MHC class I antigen processing, in regulating NK cell function by controlling the engagement of inhibitory receptors (Cifaldi et al., 2015). Human tumor cells are cultured in fresh RPMI medium at a cell density ≥ 0.5-0.7 x 106 cells/ml in an incubator at 37 °C, 5% CO2. For each experiment are required 0.5 x 106 tumor cells. Wash adherent cells with PBS (5 ml) and detach cells by adding 833 μM EDTA (1 ml for T25 flask and 2 ml for T75 flask) for 3-5 min in an incubator at 37 °C, 5% CO2. Wash cells twice with PBS (2 x 5 ml in 15 ml tube) by centrifugation at 468 x g for 7 min and re-suspend them in cold FACS buffer. Count total viable cell number with Trypan-blue exclusion method. Seed cells in round-bottom 96 well plates at a cell density of 1 x 106 cells/well. Prepare 1 well for the control (without KIR-Fc fusion-proteins) and 1 well for each fusion protein to be tested. Spin cells at 832 x g for 2 min at 4 °C. Discard the supernatant and add 100 µl/well of cold FACS buffer containing single KIR-Fc fusion proteins (KIR2DL1-Fc, KIR2DL3-Fc, and KIR3DL1-Fc) diluted 1:5 and 100 μl of cold FACS buffer with none in control cells. Incubate for 1 h at 4 °C. Wash cells with 150 µl of cold FACS buffer and centrifuge at 832 x g at 4 °C. Discard the supernatant and re-suspend cells in 50 µl of cold FACS buffer containing Goat anti-Human secondary antibody, RPE conjugate antibody (diluted 1:100) and mix carefully avoiding formation of bubbles. Incubate for 25 min on ice in the dark. Discard the supernatant and re-suspended cells in 150 µl of cold FACS buffer in FACS tubes and perform flow cytometric analysis. Viable human single cells will be selected by gating in forward scatter versus side scatter dot plot and the binding of KIR-Fc fusion proteins will be evaluated by mean fluorescence intensity (Figure 1). Acquire data using DIVA software and analyse using FlowJo software. Figure 1. KIR3DL1 binding to DAOY cells. 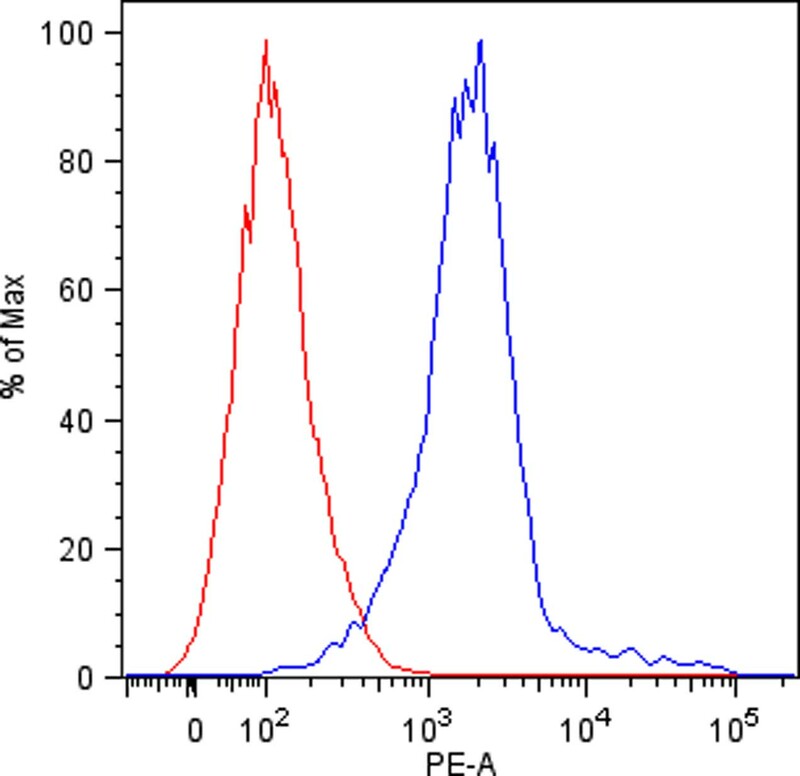 Flow cytometric analysis of KIR3DL1-Fc fusion protein binding to DAOY cells (blue line). Isotype-matched negative control antibody is displayed as the red line. This protocol was adapted from Cifaldi et al. (2015). We acknowledge funding from Italian Ministry of Health (Rome, Italy) grant and the special project 5 x 1,000 Associazione Italiana per la Ricerca sul Cancro (AIRC, Milan, Italy) grant. 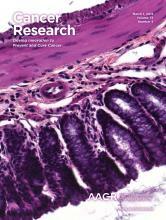 Cifaldi, L., Romania, P., Falco, M., Lorenzi, S., Meazza, R., Petrini, S., Andreani, M., Pende, D., Locatelli, F. and Fruci, D. (2015). ERAP1 regulates natural killer cell function by controlling the engagement of inhibitory receptors. Cancer Res 75(5): 824-834. Lanier, L. L. (2005). NK cell recognition. Annu Rev Immunol 23: 225-274. Raulet, D. H., Vance, R. E. and McMahon, C. W. (2001). Regulation of the natural killer cell receptor repertoire. Annu Rev Immunol 19: 291-330. How to cite: Cifaldi, L., Locatelli, F. and Fruci, D. (2016). Killer Cell Ig-like Receptors (KIR)-Binding Assay for Tumor Cells. Bio-protocol 6(18): e1931. DOI: 10.21769/BioProtoc.1931.